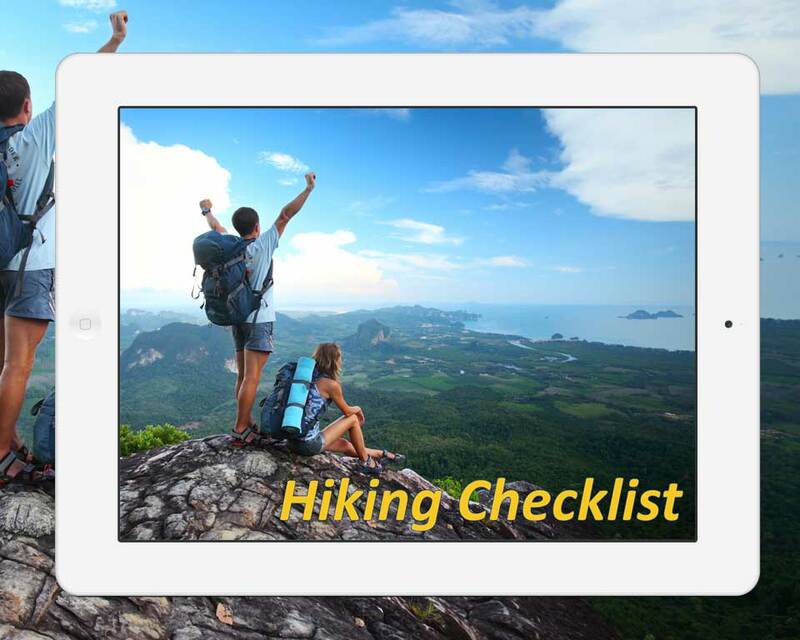 This Hiking Checklist explains how you and your group can get prepared for a hiking tour. It includes a range of tasks to evaluate your physical activities, technical knowledge, mental readiness, and other things that are essential for the tour planning. Know your physical abilities before planning for a hiking tour. In case you have some physical limitations or sickness, be sure your doctor allows you to take the tour. Take the worst case scenarios into account and develop a rescue plan in case one of those scenarios occurs. Consider weather conditions, terrain conditions, and altitudes and how they can influence your physical abilities. Take your physical endurance or strength into account. Are you really ready to take the whole tour? Hiking is a specific exercise, so dedicate some time (at least 2-3 week) to prepare your body for the exercise. Take some pre-hiking training before you go. Be ready to bring a heavy backpack all the time during the tour. Engage your group to do the listed tasks. Never hike alone! There should be at least one person travelling with you. Know your technical skills, experience and health limitations in practicing various outdoor activities during your hiking tour. Never plan for a tour that requires climbing rock faces, outdoor camping, food gathering, compass navigation, or other outdoor activities if you do not know anything about such activities. Consider having an experienced instructor who could provide you with technical knowledge about safe hiking. Ask your instructor to explain how to conduct yourself in typical emergency situations. Make records on the explanations and be ready to follow them during your hiking tour when needed. Use Internet to read about the fundamentals of safe hiking. Know your own mental strength and psychological stability. Are you able to resist stressful situations? Ask your instructor to explain how to react to possible accidents or unforeseen situations. Be ready to deal with such situations during the tour (e.g. when you get lost or twist your ankle). Mentally prepare yourself for possible incidents. Work out in your mind how you would do within an emergency situation. Don’t plan for taking your hiking tour if you’re not sure you’re able to cope with stressful situations because otherwise you’re likely to get under the negative impact of these situations; then the whole tour turns into a disaster. Smartwool socks packed in a cellophane bag (to ensure your socks remain dry). Regular underwear for daily hiking. Durable, lightweight and comfortable footwear (e.g. sandals, boots). Special hiking pants convertible into convenient shorts. Gloves to protect your hands from scratches and abrasion. Warm hat as well as brimmed hat for sun protection. Sleeping bag with a pad. Camping utensils (cup, bowl, eating utensils, small stove, fuel for cooking needs, cooking pots). Trash bag and zip locked bags. Toilet paper roll and small shovel to dig excrement holes. A 50-feet nylon cord to hang backpacking tools and equipment. Medications, including allergies, aspirin, laxative, etc. Survival Kit (e.g. in case you got lost). Waterproof matches or cigarette lighters packed in a waterproof wrapper. Some iodine tablets for water purification. Select a route for your hiking tour in advance. Use your map to find and examine the route. Decide on places, number and duration of stops and breaks. Mark your map with all planned stops and camping places of the route. Provide every member of your group with a copy of this map. Give one more copy to someone (your family member, friend) who doesn’t go with you but who knows where you go. Do this task for safety purposes. Be sure your kids are physically and psychologically ready for your hiking tour. Be sure they have proper footwear and clothes. Kids usually like to share responsibilities in hiking, so give your children their own backpacks and their food and water.